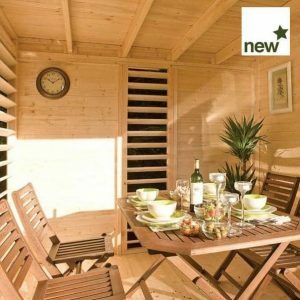 The Rowlinson Connor Log Cabin is a fantastic ultra-modern garden building that will make a feature in any garden. Combining two multi-purpose spaces, a garden building and a covered exterior area, this is a uniquely designed building that is one of a kind! This unique and charming log cabin will add value to any garden. The side panel does a very good job of letting in light and air, and makes the inside of the building feel very spacious. Adding even more value is the adjoining storeroom, which is lockable. 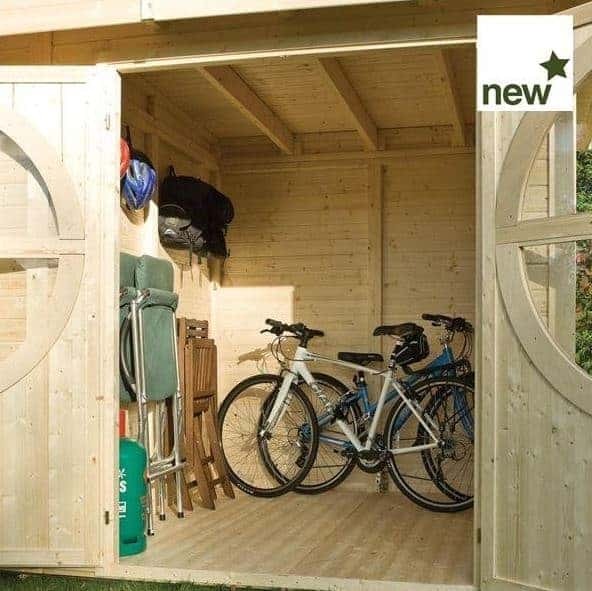 This means that you can have a building that is not only perfect for relaxation but also allows you to store tools and other garden equipment. The building comes complete with a 10-year anti-rot guarantee. To protect against rainwater, a heavy duty mineral felt roof is also fitted. The log cabin consists of two separate areas, a room secured by double doors and a charming circular window which could be used for storage or leisure, and an covered exterior area which could serve as an excellent outdoor dining area or sitting area. 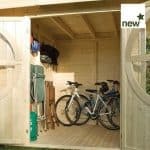 A fantastic space-saving two-in-one building that will serve multiple uses for the whole family to enjoy. The Connor Log Cabin is a unique multi-purpose garden building that has many features and potential uses. In this section we have a look in further detail at the log cabin’s different features and advantages and disadvantages that they may have. We also discuss how the building could be used for different purposes and how it could fit into your lifestyle. Exterior: With stunning contemporary styling, the log cabin is constructed from a light timber with 19mm tongue and groove cladding. Although a definite contemporary shape, the timber allows the building to look at home in virtually any garden and to blend into the natural backdrop of the scenery. Covered area: The covered area is a cosy yet light-filled space thanks to the louve side panel. It is ideal as a relaxation or dining area and has space for a table and chairs or some outdoor sofas. Enjoy the best of both worlds; protection from the sun and wind whilst enjoying the fresh air and views out to the garden. Storage area: The store room is accessible by large double doors that feature a large circular picture window. This light-filled space could be used as a storage room or as a hobby room or workshop. Security: The double doors to the store room come complete with a lever sash lock to keep the door firmly shut and the contents inside secure at all times. 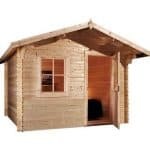 2.46m x 4.9m Rowlinson Connor Log Cabin: How easy to build? When looking for a log cabin to purchase don’t be put off by the Connor log cabin’s size, thinking that it will be too much of a challenge to build. If the task seems too overwhelming there is the option of using a home installation service at an extra cost. If you are up for the challenge, assembly is made as easy as possibly due to the thorough and easy-to-follow step-by-step instructions and diagrams. We definitely recommend that at least two people work together on assembling the log cabin due to the larger size of the panels, parts and building as a whole. 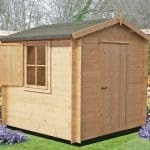 2.46m x 4.9m Rowlinson Connor Log Cabin: What is the overall quality like? 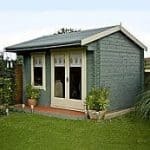 This stunning cabin gives a fantastic first impression and you can tell from the quality of the design and construction that you are buying a product that will be standing in your garden for many years to come. This particular model carries a 10-year anti-rot guarantee provided that the cabin is treated yearly. The strong timber uses 19mm tongue and groove boards to provide a sturdy structure for the building. The heavy duty mineral felt roof is both weatherproof and uses quality materials to ensure a long life. 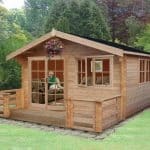 The log cabin is virtually maintenance free with the exception of the yearly timber treatment that must be applied to keep up the manufacturer’s guarantee. 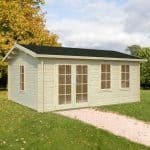 If you wish to give the log cabin a personality of its own, a factory painted finish is available as an optional extra. 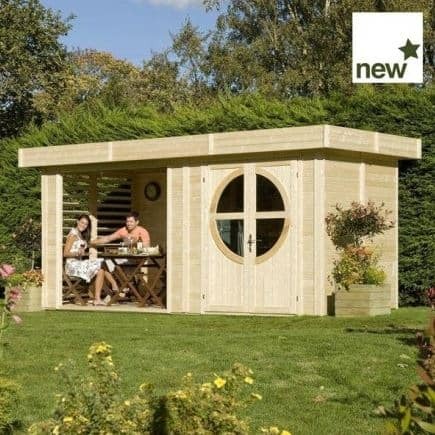 The Rowlinson Connor Log Cabin combines a contemporary aesthetic with a highly practical and multi-functional space to create a garden building that truly has the wow factor. Use the log cabin in a number of ways to accommodate your garden storage or living space needs. The incredible 8x16ft overall space could be used to store garden equipment and create an outdoor dining area, all within the same building. Don’t miss out on this fantastic log cabin!